After getting done with the night dive and dinner around midnight, neither of us were keen on diving the next morning. 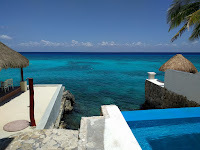 We decided to check out the Mayan ruins on Cozumel in the morning and then just relax for the rest of the day. It was shaping up to be an extremely hot and humid day, so we armed ourselves with multiple bottles of water and took the short cab ride to the ruins. San Gervasio isn't a very large site and can be easily walked in a couple of hours, including all the off shoot trails. I enjoyed the trail walks through the jungle just as much as the ruins themselves and can't wait to visit the larger sites in Tulum and Coba. I really wanted to try some lionfish on this trip and the best place for that is La Perlita. I'd assumed lionfish was a novelty dish after hunting it became the cool thing to do in the Caribbean but, dang, was it delicious!! The meat is mild but flavorful and also got A's stamp of approval which, for fish, means that she took a bite and didn't immediately make a face. After a margarita stop and a fish-nibbling-your-feet massage, we headed back to the villa; me to snorkel the dock and A to nap. There's a lot of juvenile life in the rocks around the Aldora dock - I saw a lot of small angelfish and damselfish. There's a small overhang under the dock which was reputed to have octopus in it; I didn't see any of those but did see a spotted moray which didn't look too pleased with my incursion into its space. I was in the water for a few hours without even noticing it, the setting sun eventually gave me some indication of how long I'd actually been splashing around. Our 2nd dive day was a little different in that we were scheduled for an afternoon and night dive. Since Aldora only does the night dive once or twice a week, they're pretty packed. Which meant a much bigger boat and getting to the downtown pier instead of being picked up at the villa. As with everything on the trip, Aldora made sure this required minimal effort on our end. We ended up getting a ride in a rust-bucket of a pickup with busted windows (that didn't close), exposed wiring in the steering column (the ignition key didn't work) and ripped vinyl seats - I always considered this to be a quintessentially Mexican experience (I blame Hollywood for injecting this stereotype in my head). With about a dozen divers in the group, we had 3 DMs (Liang, Sophie and Jorge) riding herd. The first dive was on the Santa Rosa Wall and was one of the most amazing dives I've done so far. The reef was continuous as far as the eye could see and bursting with color and life - there was way too much to take in individually. The wall started at around 30ft and went down far deeper than I cared to look. It took a few minutes of experimenting in the current to get stable in this position but head down feet up worked really well for me to just drift and see all of the reef without minimal kicking to keep position. Before the night dive at San Clemente Reef, Liang was giving us a briefing and telling us about some of the different creatures we would see. In passing, she mentioned that we would probably see some blood worms towards the end. There was still some ambient light under water when we dropped in but it turned to pitch black pretty quickly. As is in my nature, I hate to brag but A and I accounted for most of the sightings that night - spotted morays, a Caribbean reef octopus and a stingray. The annoying thing was that anytime we pointed something out, the entire group descended upon us in a rush to get it on video. Not to mention the awful light discipline and the terrible awareness of anyone around them. Oh, the jostling. So much jostling. I guess I shouldn't complain too much - a drift dive in pitch black would be hard for anyone. Nevertheless, it was a fun experience. Until we attracted the blood worms. There were jillions; it was literally like swimming through a dense cloud of these things. And they got everywhere - in our hair, on our faces, on the gear. Everywhere. And they latched on even as we ascended and got on the boat. We were picking them off of us for a while after the end of the dive. A still shudders at the thought and decided pretty quickly she didn't want to do anymore dives that had even the remote possibility of blood worms. One thing I did notice today is that my Hollis F1s are far too heavy for this kind of diving .i.e. warm water and minimal exposure protection. A had the same thought about her Jets. I saw all the DMs using freediving fins and might give that a shot. Deep6 has stiff paddle fins designed for fresh water which also look interesting. We ate at La Choza earlier in the day (great overall - ambience, food, margaritas) and Senor Frog's (oh, the horror) after the night dive, primarily because we were famished and nothing else was open when we got back. 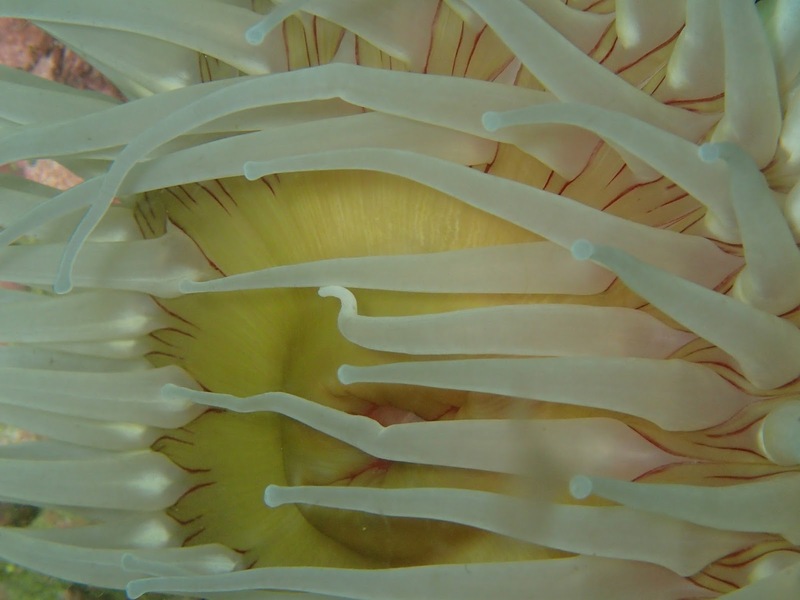 Staying and diving with Aldora made our mornings super easy. Fall out of bed, walk out the door and on to the boat; dive rigs already set up and ready to go. Generally, I'm not too thrilled when someone else sets up my gear but the Aldora crew did a bang up job. Our backplate+wing and longhose setups didn't faze them in the least (most of their DMs dived the same setup as well)- they saw me make some adjustments to my rig the first day and set it up like that for the remaining days. Awesome! At the end of the day, all we had to do was break our rig down and put it into mesh bags which they took back to the shop and rinsed off for the next day. Honestly, I'm pretty sure they would have done that for us as well but I preferred to do it myself. This was my first experience with a full service dive op and I was thoroughly impressed by Aldora. Another good thing about diving with Aldora is that they use higher capacity steel tanks instead of the standard AL80s. I was setup with an HP120 and A had an HP100. HP120s are noticeably longer than anything else I've dived and it's not the easiest to manouver on the surface; not a huge problem in a 3mm shorty but I wouldn't want to deal with them in a drysuit. Having all that gas was pretty sweet though. Since this was our first time diving in Cozumel, Aldora took us to what are essentially the check-out dive sites on the first day. Our first dive was at Palancar Gardens and our DM, Ricardo, gave us a few tips on dealing with the current. The only other people on the boat were another couple, one of whom had just finished her OW class. Initially, Ricardo herded us around a little bit but after seeing A and I in the water for a few minutes, he focussed on the other divers for the rest of the dive. There was very little current by Cozumel standards but I managed to ignore everything he had told us earlier about avoiding it and found the worst spots around the reef for that. This was mainly because I was trying to avoid getting kicked by the other couple who were not very conscious of their position in the water. I ended up kicking against the current more than I should have but the big tank more than made up for that. The visibility was absolutely amazing, I'm guessing around 80ft or so but, to be honest, I kinda have no idea once it gets beyond the 30-40ft I'm used to at home. There were multiple varieties of parrotfish (my favorite), jacks and angelfish and some huge groupers followed us around as we swam through the rocks. We also saw a hawksbill turtle on the first dive which was awesome. I also liked the huge barrel sponges with cleaner shrimp in them. The surface interval was on a private beach that has a cafe and some chairs to relax on. I spent the hour there walking the beach, splashing around in the shallows, attempting some horrendous still photography with the Gopro and getting pretty burned; A made the smarter choice and napped. 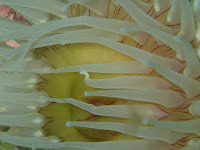 The 2nd dive was at Tormentos Reef which was quite similar to Palancar. I saw a midnight parrotfish, which I hadn't seen before, and a couple of barracuda!! This was my first time seeing them and I was really looking forward to it. A assured me that these ones were pretty small and there's much larger ones in the Keys (yeah, we're going there next). It got surprisingly dark halfway through the dive and I didn't quite understand why until we got to about 20ft and I saw raindrops on the surface when I looked up. Turns out it wasn't just a few raindrops but a pretty epic thunderstorm that we surfaced to - a hasty re-entry into the boat later, our little boat hauled (and I mean HAULED) back to the dock. We ate at Mar y Juana later that day - it was OK, not the best on the trip. I thought the name of the restaurant was quite poetic, like "Juana and the Sea" or something along those lines. In hindsight, it was quite obvious that that's not at all what they were going for considering that the staff was wearing Rasta hats and dreadlock wigs :P A was quite amused that I didn't figure that out on my own. Like, at all. We swam out, dropped in our usual spot and took a NNE heading with the intention of finding Hole in the Wall (which I still haven't seen). Visibility was decent, around 30ft, but there was a lot of large particulates in the water. I'm gonna go with whale snot. 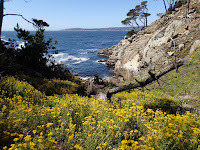 We weren't looking for the sand channel, instead choosing to swim over the slightly rubbly reef on the left side and spotted the usual contingent of Monterey dorids along the way. We hit turn pressure around 70ft without seeing Hole in the Wall and headed back in. A squirrelly ascent, with liberal kelp grabbing for stability, brought us back pretty much where we had dropped. We chatted with raftingtigger and 3Ddiver during our surface interval and got some tips on finding HITW (take a heading towards the last bird poop rock at the drop point). Refueling (leftover garlic bread from 2 days ago, mmmmmmm) and a tank change later we were back in. This time, the plan was a little more fool proof - Middle Reef. The swell had pushed the kelp towards the east side of the cove which made the surface swim a lot easier. The visibility was about the same, albeit a little clearer than before. I had the bejeezus scared out of me when I swam over some large lings and failed to notice them until they moved away when I was practically on top of them. sea_otter's backup light twisted itself on and there was some faffing around as I tried to communicate that to her. We rounded the end of Middle Reef with plenty of gas to spare and decided to continue going around on our way back in. Just around the overhang, I saw what I thought was a large horizontal crevice in the rock and went closer to take a look inside. Bejeezus scared out of me again as the crevice wasn't a crevice but another humongous ling. This is the first time I've seen one which such a dark coloration - it was almost completely black. We continued on the back side of the reef and sea_otter seemed confident in her navigation skills to get us back close to the worm patch. 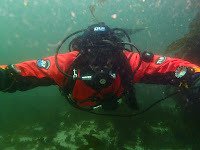 I shared that confidence until we ended up in about 20ft of water surrounded by some pretty thick kelp. 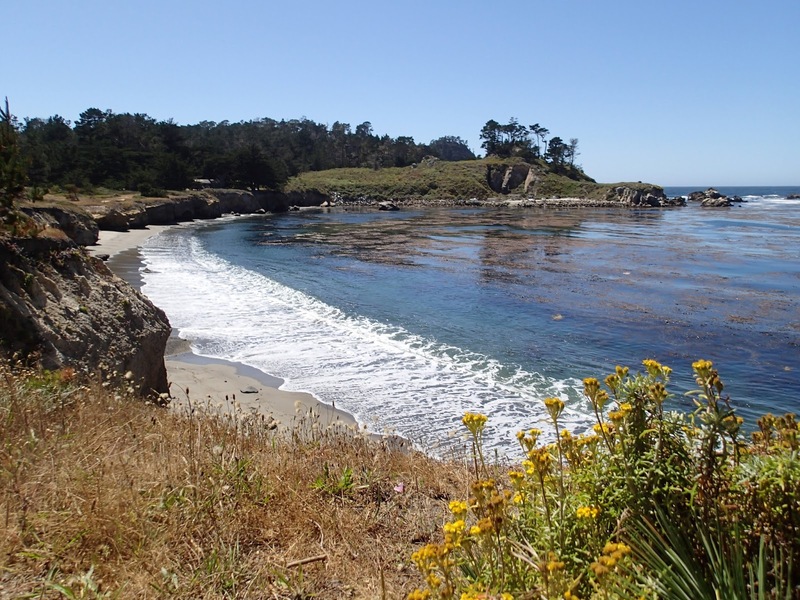 Remember when I said the swell pushed the kelp to the east side of the cove and made our surface swim out super easy? Yeah, east side of the cove is exactly where had ended up. We ended up clawing our way back through the salad pretty much the entire way across. A fun day of diving was capped off by an absolutely beautiful day topside. Hole in the Wall eluded us once again but we think we have a better plan for next time. All photos courtesy of sea_otter. 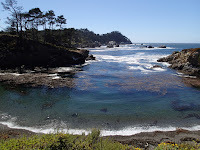 In an attempt to get to Pt Lobos before the gate opened, I had to leave home at stupid o'clock, which meant a wake up time of stupider o'clock. Even Koda and Cousteau seemed non-plussed when I was up and about and they're usually good to go whenever; Billie didn't deign to open her eyes until she realized everyone was getting fed. ParaMike had driven down from Fairfield which meant he woke up and left at wtf o'clock. I assume he got some sleep while driving down here since he was wide awake when we transferred all his gear into the Death Star. I was trying out my new dry gloves system today. I had opted for the simplest (and cheapest) setup available - the SiTech rubber pullover rings - since I wasn't quite sure how much I would like the relative loss of dexterity in the water and didn't want to drop $350 on the Kubi system I was secretly coveting. The install on the ZipSeals was super easy once I popped them off the drysuit. All it is is a hard plastic ring the goes on the inside of the seal and a corresponding firm rubber ring that goes around the outside. The rubber gloves that go with simply stretch over these rings and form a seal on the 2 grooves - no O-rings to slip, tabs to break off, parts to get gunked up or any alignment needed. The wrist seal is not impacted at all and would be a secondary seal in case the glove was damaged or popped off somehow. I wore thin merino wool liners under them and was able to don and doff them pretty easily on my own. They seem a little floppy on the surface but not too bad as I was able to get my rig on and everything hooked up and arranged on my own. It's recommended to put a little piece of bungee or tubing under the wrist seal to allow some gas into the gloves (which I neglected to do) but even that didn't cause any trouble during the dive. We were geared up and in the water around 0930. Visibility in the cove was awful and there was a lot of kelp around. We had to weave around quite a bit to get to the sand channel. 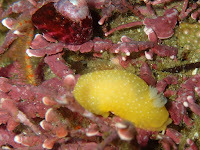 We surface swam out past the Dog and dropped in the sand channel in about 40ft. The viz was pretty good as we made our down through a school of senoritas and remained that way for the rest of the dive. There were a couple of ling cods on the prowl and a mahoosive vermillion rockfish as we made our way along the Cannery Point Wall. I spotted a few Monterey dorids, Doris montereyensis, but no other nudibranchs. We were aiming for Hole in the Wall and should have stuck to the border of the reef and the sand channel. Instead we went through all the rocks and cut between the little walls that are at the north end of that reef. It was a lot of fun and really beautiful but I was pretty sure we had overshot our target since we were in about 85ft. We hung a left to return from the west side of this reef but went too far west and ended up right in the middle of the Cannery Point Rocks. Not good. Like, really not good. 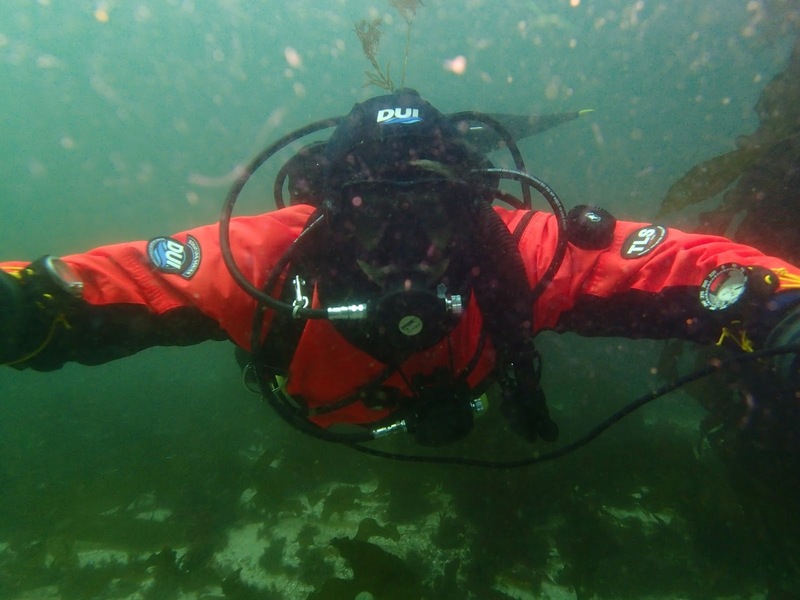 It was insanely surgy above 30ft and we were getting thrown about 10-15ft in every direction in the middle of the rocks and kelp. When I surfaced to take a bearing I realized we were in a bad spot where the swell was about 5-6ft and the waves crashing into the rocks could be heard pretty loudly even through my thick hood. After an "oh sh*t" moment, we high tailed it out of there and ended the dive early with a looong surface swim back. Good dive overall despite the navigation errors. We got some pointers later for better ways to dive the west side reef. We skipped dive #2 as I was very low energy after the surface swim - forgoing breakfast that morning had also not been one of my better ideas. Lessons learned. The dry gloves were awesome, staying dry and warm for the entire 90min we were in the water. Post dive at Papa Chevo's where I practically inhaled a giant plate of fish tacos.